Why Hasn't my Boyfriend said I Love You after 6 months? Dear Sybersue answers another popular question on her advice column. Niki wants to know why her boyfriend of 6 months hasn't told her he loves her yet? They are together all the time and things seem to be going great but he hasn't said those magic words she wants to hear! Why hasn't he? Is Niki being impatient? 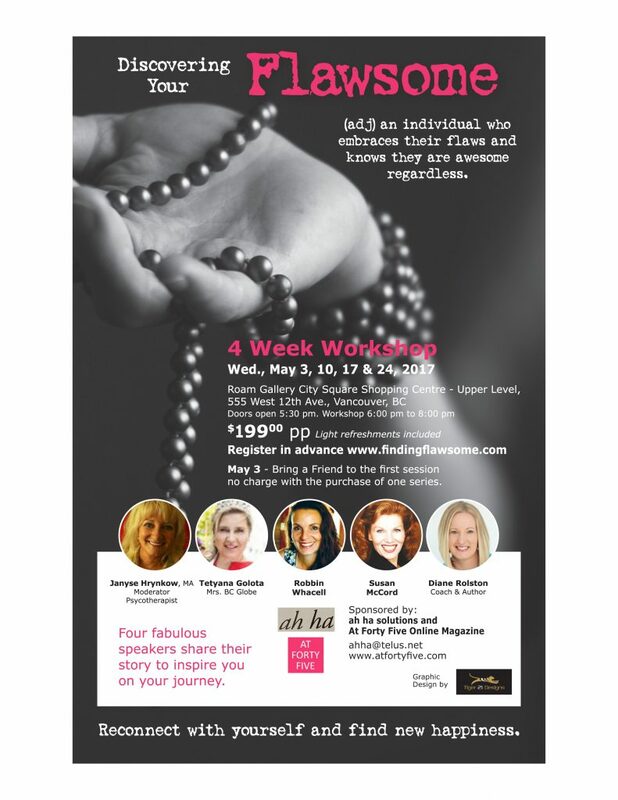 Vancouver Women Discover Your Flawsome! I am very happy to be one of the speakers at this women's empowerment workshop! You are beautiful just the way you are but there is always room to learn more about yourself and add a little diversity to your life. Are you asking yourself what next? If I am so wonderful, why am I not feeling happy? Perhaps you are pondering where do I want to go in the next twenty years. What barriers am I facing? The workshops will lead you through the process of reconnecting with yourself while providing information and support so you can implement and integrate action plans. Live life fully and embrace your flawsome! Focused on working with corporations, entrepreneurs, and individuals, Linda assists clients to clear overflowing piles of information and possessions, streamline processes and procedures, and develop systems to get organized and stay organized. Helping people get where they want to be as they move forward through the hardest times of their lives, including job loss, career transition and professional reconnecting to the world of work, Winnie believes life is about thriving not surviving! Blessed with the “Best Brain Tumor” Tetyana feels she has been given a second chance and shares a powerful message. Your life may not be perfect, but whatever obstacles you are facing, the joy of living is paramount, so choose it. A psychotherapist, trainer and speaker, Janyse works in the corporate and public sector. In private practice, she consults and counsels individual, families, children and groups. She has implemented many seminars and courses dealing with the dynamics of the human experience..
Susan is best known for hosting a relationship talk show for an International audience on YouTube. “The Dear Sybersue Talk Show” with over 1.5 million views. She is a guest blogger and appears on TV including CBC news, TorontoNewsTalk1010, Sexat11 RogersTV Toronto, The Love Channel, Trying to be Good RoundHouse Radio and The Lynda Steele Show CKNW. Leveraging all of her education and experience, Melody Ann helps bloggers, entrepreneurs and other professionals to plan, write, produce and market books increasing their success. She started an online directory, blogs and writes books to support better living. Twenty years in law enforcement, a significant motor vehicle incident in the line of duty jolted Krys awake in her own life. Now retired and a professional co-active life coach, she empowers people undergoing transitions in life and/or career, self-image, and grief. Helping high achieving women go from overwhelmed to clear and confident, Diane coaches women to push past limitations and succeed with their career, business, family, relationships, and personal achievements. Her training and books encourage women to stop being superwomen and be free. Co-founder and editor of one of The Bahamas’ leading news sites, TheBahamasWeekly.com, Robin is a successful entrepreneur, a pioneer in online marketing, a recognized media personality and a community builder. She is known for her networking, mentoring and social media skills. Author of “Life Outside the Box” with more books underway, Marilyn specializes in interviewing and telling people’s stories. Recognized for her passion and dedication to the fashion community, she received the 2017 Vancouver Fashion Week Ambassador Award. A visual artist, Sandra also published “My Schizophrenic Life: The Road to Recovery from Mental Illness” and “Chop Shtick“. She is an advocate and spokesperson on mental health issues and appears in “Psychopia” a short documentary directed by Ali Virk about her journey of recovery.